Cruising can sometimes be confusing, especially for a first time cruiser. 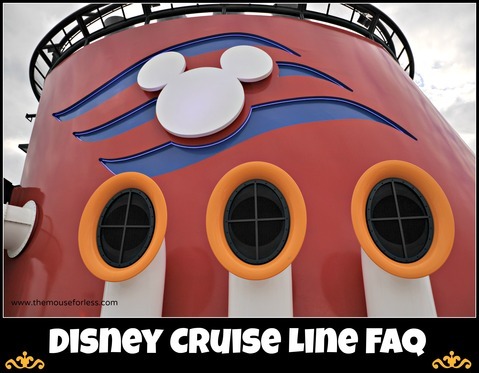 Luckily, we have the most common Disney Cruise Line Frequently Asked Questions here for you to help you with the planning process. What is Included in your Cruise Price? On board the Disney Cruise Line ship, your vacation package price includes almost everything — from your stateroom itself to breakfast, lunch and dinner, as well as snacks every day. In addition, all the onboard programming and entertainment are included. The recreational activities on the ship, access to the fitness center, and the kids programs for kids ages 3-17 are all also included in the price you have paid. While you’re sailing, there are only a few things that will require an additional charge. Examples of what is not included are spa or salon visits, phone calls, photos, video games, internet usage, bingo, and all alcoholic or specialty beverages. There is a charge for childcare for children under the age of three if parents choose to use it. There is also a nominal fee to dine at Palo or Remy (the adults-only restaurants found on both the Disney Dream and the Disney Fantasy). Shore excursions are also not included. In addition, some seminars incur a nominal charge, but it will be clearly listed when registering for the activity. Finally, gratuities is not included in the price of your cruise. Gratuities are one of larges additional expenses most people will incur during the sailing. You shouldn’t be. There is so much to do including recreational activities, night time shows, midnight buffets, live bands, movies, ports of call, swimming pools, fitness centers, kid’s activities, characters, incredible meals, shore excursions, dance clubs, family photos, unique ports of call like Castaway Cay, and so much more. You may be having so much fun, you may forget to relax! All U.S. and Canadian citizens must travel with a valid passport, or a certified birth certificate (with official raised seal) and picture identification, if the cruise is a closed loop cruise. (Meaning you depart and arrive back in the same port.) If you are traveling to a location that is not closed loop, where you end up in a different location where you started, you will need a valid passport that does not expire at least six months after you cruise. All Guests who are not U.S. or Canadian citizens must have valid passports and necessary visas at time of embarkation. Any Guest traveling without proper documentation will not be allowed to board the vessel and will not be entitled to any refund. More information on documentation can be found on our Required Documentation and Customs page. While getting seasick used to be a concern when taking a cruise, this actually doesn’t affect too many people any more. The Disney Cruise Line has stabilizers and other high-tech controls that minimize the ship’s movement. Also, weather tracking devices help to keep the Disney Cruise Line in calm waters as much as possible. Chances are you will experience a wonderful cruise and won’t have to worry about seasickness at all. There are several over the counter remedies for seasickness that some guests choose to bring with them just in case it happens, though. Occasionally, weather conditions and other circumstances beyond Disney Cruise Line’s control require an itinerary change. In these situations, the cruise line will make every attempt to visit alternative ports where guests will enjoy popular vacation destinations and safe conditions. Sometimes itinerary changes will occur during the sailing. For example, occasionally rough seas make it impossible to dock at a certain port. While this doesn’t happen often, it is best to prepare for the unexpected. What are the Best Times of the Year to Cruise? Any time of year is perfect for a cruise, and each season has its pros and cons. If price is your main concern, January, September, October, November and the first weeks in December offer good pricing. Be aware that hurricane season is June 1 – November 1, which the most activity happens in the fall. Hurricanes rarely cause any major interruption to your cruise. 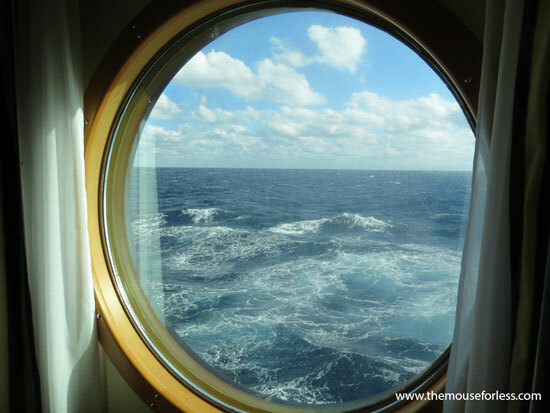 Should one come up during your sailing, Disney Cruise Line will alter plans, as needed. Keep in mind that cruise dates near any major holiday or when children are generally out of school are more traditionally more expensive. When Should I Book my Cruise? Guests should book as soon as they have travel dates. The earlier the cruise is booked, the better the pricing. As the number of cabins booked on a particular sailing date increases, the price of the cruise will increase. The best prices and most availability will always be right when the sailings are released. 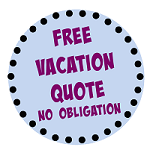 We suggest you contact The Magic for Less Travel at www.themagicforless.com to assist with your booking. 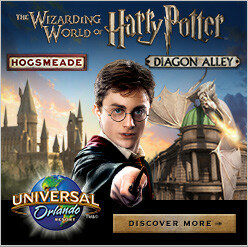 The Magic For Less Travel will provide excellent customer service. Disney has named them an Authorized Disney Planner. They can help with all your cruising questions, booking, planning and more. Since cruises have steep penalties for canceling, we think trip insurance is a good idea. Most policies also cover things like lost luggage and illnesses while on vacation. Check the specific policy for inclusions. Do I Need to Bring any Special Clothing? Just like the Walt Disney World Resort and Disneyland, Disney Cruise Line offers a casual, informal resort atmosphere. Shorts, capris, pants, sundresses, etc. are all appropriate for warmer seasons. In the winter, a light jacket or sweater may be needed for cooler days and nights. Don’t forget to bring comfortable shoes as well as shoes for hanging out at the pool. Also, don’t forget to bring your swim attire. As far as attire for the dining rooms, dining dress requirements vary by venue or theme night on your cruise. In general, most meals are “Cruise Casual”—no swimwear or tank tops. Most cruises also have special theme nights with additional attire requirements. Button-down, open-collar shirts or polo shirts and slacks are recommended for men. Pants and a blouse or a casual dress are appropriate for ladies. In addition, shorts are now permitted in the three main dining rooms. Disney Cruise Line requests that no T-shirts or jeans be worn in any of the restaurants in the evening. For Palo and Remy (the latter can be found on the Disney Dream and Disney Fantasy), a fancier dress code applies. At Palo, the requirement is dress pants with a shirt or jacket for men. (Jacket is optional). For women, a dress or pantsuit should be worn. Jeans, shorts, capris, flip flops and tennis shoes are not allowed. At Remy, a tuxedo, sports jacket, or suite jacket is required along with dress pants for men, with ties optional. For women, a cocktail dress, pantsuit, or skirt and blouse are required. Jeans, shorts, capri pants, flip flops and tennis shoes are also not permitted here. Aboard the 7-Night Caribbean Cruise there is a formal and semi-formal where Guests can wear more formal attire, if they choose. Don’t be overly stressed on what to pack for your cruise. Consider what you will be doing each day on the cruise. Where will you be going? What will you be doing? Pack according to your probable activity. Think comfort and practicality. Pick clothing that can be mixed and matched. If you want to make sure you won’t forget anything, go through the Ultimate Cruising Packing List and pack to your heart’s desire! Where Can I Park my Car While I Cruise? If the Guest’s vehicle takes up more than one parking space (for example, RV or trailer), the guest is charged $15.00 per additional parking space per day. Preferred parking is also available for $25.00 per day. The preferred parking area is located inside the secured area, next to the vehicle drop-off area. Other departure ports will have parking available at the cruise port. Should I Fly in the Day of the Cruise? We strongly suggest that you fly in the evening before your cruise. You are responsible for arriving at the port at least an hour and a half before your scheduled ship sailing. If your flight is delayed or cancelled, this might mean that you miss your boat–literally. You can direct-dial anywhere in the world right from your stateroom. Ship-to-shore rates apply and will be posted in your stateroom. Unfortunately, it’s not possible to dial any 800 numbers from the ship, so your calling card will not work on the ships. Be aware, though, that the charges are quite high (upwards of $7 per minute). Many guests find that e-mail is a less expensive method of communication, although be aware of data roaming charges if using a cell phone. There are internet usage packages are available, however they can be quite costly too and data may get used quickly. Also, if using a calling card, many ports will have a place to make those international calls for a little less. If you friends and family at home need to reach you they can call (888) 322-8732. This number should only be called in the case of an emergency. How Can I Communicate With my Friends and Family Onboard the Ship? Guests are invited to download the Disney Cruise Line Navigator app. Through this app, Guests can stay in touch with their shipmates with one on one or a group chat option. All Guests in the party should make sure to download the app prior to sailing. Don’t want to download the app? There are also Wave Phones available for Guests to use. While aboard the ship and on Castaway Cay, Guests can reach out to your fellow travelers via Wave Phone by allowing you to text and call without using your personal cell phone. From your Wave Phone, you can call any shipboard phone, stateroom phone or other Wave Phone, making it easy to connect with your travel party or new friends. In your stateroom, you’ll find 2 Wave Phones. Additional phones are available at a fee. For a fee, on board, laundry and dry-cleaning services are available. There is also a self-service Guest Laundry Room with washers, dryers, detergent, and ironing equipment that are operated using your ship’s room key. A physician and nurse are on call 24-hours a day on every cruise to provide basic medical services. The physician and nurse will charge their standard fees for services. Insurance coverage is not accepted as payment for medical coverage. The fee will be billed to your stateroom account and the guest can then submit the bill to their insurance company, if covered. More serious medical conditions would be assisted in the closest port of call. Although religious services are not typically available, during certain religious holidays, an onboard clergy performs services. Information will be provided onboard. What are the Smoking rules? 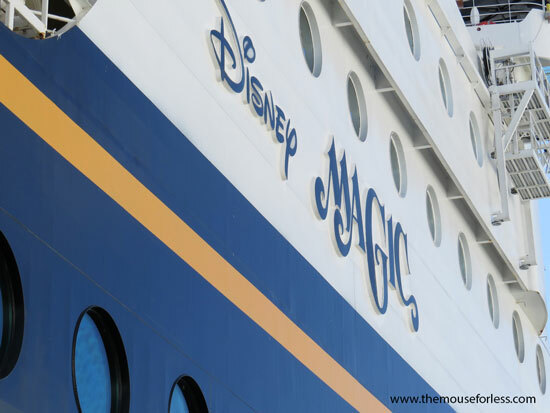 Disney Cruise Line does not allow smoking in Guest staterooms. Smoking is also prohibited in all interior spaces throughout our ships. Beginning November 15, 2013, a new rule will go into effect where smoking will also be prohibited on stateroom verandahs. Smoking (including the use of electronic cigarettes) is only permitted in designated areas of the ship. Guests found smoking in their staterooms or on their verandahs will be charged a $250 stateroom recovery fee, which covers deep cleaning that includes air filter replacement, carpet extraction and the cleaning and replacement of drapes, comforters, blankets and pillows, along with verandah cleaning and maintenance. The starboard side open-air decks 9 and 10 (with the exception of the Mickey Pool area). Are there Standard Outlets in the Staterooms? All stateroom outlets are 110V/60 Hz. Standard U.S. electrical appliances will work on board. There’s a hair dryer in every stateroom. Guests may not bring along an extension cord or a power bar with them. Are there Refrigerators in the Staterooms? There is a small refrigerator. It doesn’t get very cold, but is made to store beverages. There is also an ice bucket in each room. Disney Cruise Line has a convenient “cash-free” system on board. When guests check-in, a credit card is put on file for charging privileges throughout the cruise. Any purchases on the ship, including beverage services, spa, salon services, photography, medical and laundry services, purchases from retail shops, gratuities, and any item or service of a personal nature must be charged to your room charge. All charges will be settled prior to debarkation from the ship by cash, personal check (with proper ID), traveler’s checks, Disney Dollars, or major credit card. Guests paying by a method other than the credit card on file will settle with guest services the evening before the end of the cruise. In the Bahamas and the Caribbean, U.S. dollars and major credit cards are accepted almost everywhere. European and Canadian itineraries may require local currency for expenses in port and pre- and post-cruise.